Discover the fate of Dage the Evil's soul! In-game, Dage the Evil is the leader of the Undead Legion, ruler of the Underworld. In the REAL world, the artist behind the NPC has one, true love... PVP! That's why this year, AQWorlds is celebrating with a battle-birthday full of new Undead Legion gear, a Dark Caster Collection Chest, two new Underworld PVP maps, and more! Save 2000 ACs on event gear: Get all of Dage’s birthday items in his Dark Caster Collection Chest for 10,000 AdventureCoins (16,000 ACs worth of gear for 10,000 ACs is a really GOOD deal from a very Evil Artist)! Dage's Dark Caster Collection includes: over 20 items, plus a character page badge and the Collection Chest pet! * The Immortal Dark Caster CLASS will arrive next Friday. ** This is for heroes who prefer a more classic Paragon Pet look over the Shogun Paragon pet. Like in AdventureQuest 3D, the items for Dage's birthday this year (which can all be found for 0 ACs in Dage's Dark Caster Collection Chest) will return to Dage's birthday shop each year. But the collection chest (and the discount it gives) will only be available THIS year. Just want a couple of the items listed above? Apart from the exclusive Dark Caster Collection Chest pet itself, all of the gear contained inside the Dark Caster Collection Chest will also be available individually in his Birthday Shop. More surprises from Dage the Evil! 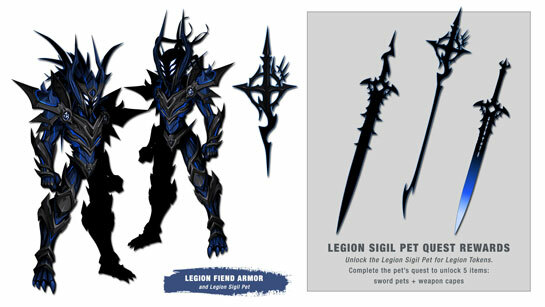 His Legion OverFiend Blade pet drops from the "Taking a Boat Trip" available on the Shogun and Paragon Pets. Plus, we've increased the quest turn-in stack size from 10 to 50. Happy farming, heroes! Get your tokens ready! This week, you'll be able to buy 13 NEW items crafted by Dage the Evil, Axeros, and AQW Community Artist L A E.
If you're not a member of the Undead Legion, never fear! You, too, can sell your soul to Dage the Evil and become a part of his immortal army. ** The Altar is ALWAYS available as a drop from the Treasure Chest, but now you don't have to rely on Luck to get it.